A fire 25 years ago marked the end for Vic Berry’s, one of the most prolific private scrapyards to deal with ex-BR diesel locos, units and stock. Ashley Butlin tells the story of the Leicester scrapper. OVER the years, many scrapyards have gained notoriety for a number of reasons. In the Fifties, both Swindon Works dump and North Road, Darlington were well documented for the number of locomotives being processed. As withdrawals gathered momentum towards the end of the decade, British Railways could no longer cope in-house with the vast numbers awaiting cutting, so it sold off locomotives to the many private yards that seized the opportunity to either expand their existing work, or enter the business. Some of these were very small cutting just a few locomotives, while others – such as the two yards operated by John Cashmore at Great Bridge and Newport – processed many hundreds of locomotives. Arguably the most famous yard dealing with steam was owned by Dai Woodham at Barry, South Wales. In numerical terms, it was in fact only minor in the overall scheme of work, but famous for the fact it cut so few of its purchases, selling the vast majority on to preservation societies. Without Dai Woodham, the present-day preservation movement would be so much poorer had it not gained approximately 200 locomotives from Barry. With the end of steam, most yards ceased cutting, although a small number added the early pilot scheme diesels that rapidly fell by the wayside, along with many of the early-built diesel shunters that were deemed surplus in the National Traction Plan review. By the late 1970s and early 1980s, withdrawals again increased. Initially BR dealt with many in its workshops–principally at Swindon, Derby, Crewe and Doncaster – but, as numbers of withdrawals escalated, so BR again turned to the private sector to help with disposals, most notably the firm of Vic Berry in Leicester. The background to this Leicester firm is not totally clear. Back in the 1940s it was recorded as cutting industrial steam engines, many of which existed locally in the numerous ironstone quarries in the surrounding counties. 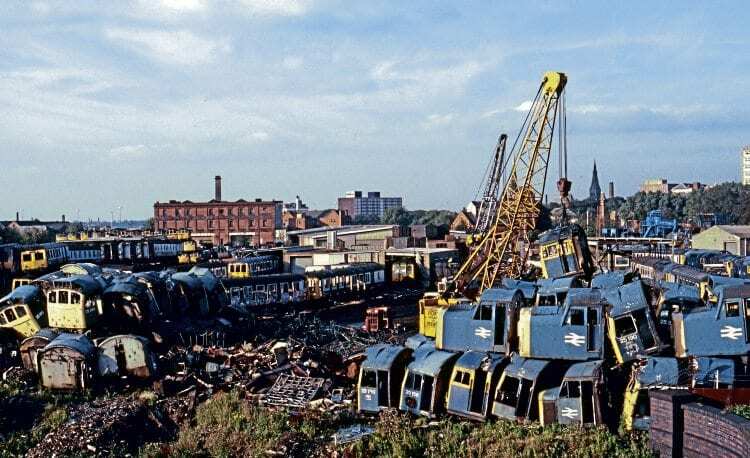 In 1969, two scrapyards are recorded as working out of the former Great Central goods yard to the west of the city. These were Frank Berry and AE Piggot & Sons, both located alongside Western Boulevard. All the indications point to both yards dealing with local scrap, which was transported out by rail. British Rail sales sheets record the first sales of coaching stock to Frank Berry in July 1976, with regular sales following. In 1973, Vic Berry – brother to Frank – also began trading out of the GC goods yard, initially cutting redundant wagons. Photographs from the time show that the majority of the site was still in use by BR, so the actual location of Vic’s activities is far from clear, although he may have shared space with his brother. The first reported sales of coaching stock vehicles to Vic Berry were in September 1980. These were SR Departmental Nos. 70092 and 70093, followed by three further successful sales tenders in 1981 totalling 33 vehicles. During 1982, sales of coaching stock to Vic Berry increased substantially, while sales to Frank Berry remained steady. It was at this time that Vic would appear to have taken over much more of the goods yard. But uncertainties creep into the picture, as stock sold to Frank is recorded in Vic’s yard and vice-versa – causing conflicting sales reports in contemporary railway magazines. Approximately 35 years on, it is all but impossible to get to the bottom of the trading arrangements between the two yards. Possibly they resold stock to each other to keep their cutting teams busy. But as historians, we can only show actual sales facts and record observed locations where they differed. At some point in the Eighties, however, there was a parting of the ways. In a conversation with Vic Berry in 1987, he made it very clear that his brother’s name should not appear in a book being written about his company. Later conversations with former employees re-iterated the animosity between the two. Locomotives first appeared for scrapping on the site in April 1983 with the arrival of Class 76 Nos. 76003/37/40, although it appears these were sold to Frank but cut by Vic! Later in the year, 14 examples of Classes 82 and 83 arrived in October, all sold to Vic Berry. While these early locomotive arrivals at Leicester gave a hint of what was to come, it was not until the autumn of 1986 that numbers began to increase rapidly. In the intervening period the firm continued to tender for and purchase redundant coaching stock. At this time, first-generation DMUs, EMUs and loco-hauled coaching stock were being withdrawn in increasing numbers. While many were sold to Mayer Newman’s at Snailwell, near Newmarket in Cambridgeshire, Vic took increasing numbers during 1984 and 1985 – with more than 600 vehicles arriving during the two years. It was as early as 1984 that the yard began stacking stock in order to save space. Initially this involved EMU coaches, which were removed from their bogies and stacked seven by seven, three layers high. Later, when space allowed and the cutters needed work, they would be lifted from the stack and cut. In addition, they were actively cutting stock on sites away from Leicester, including Class 25 No. 25261 at Derby Works in November 1985 followed by Nos. 25033 and 25088 at Derby Etches Park in February 1986, along with Class 27 No. 27203 in March. No. 45068 was cut into three pieces at Allerton and the remains returned to Leicester for final cutting. The same fate awaited Class 45 No. 45014 at Manchester Ashton Road yard in August 1986. It would seem that cutting locomotives was a profitable step for the company, as in October 1986 six Class 45s arrived, followed in November by a further eight Class 45s and five Class 25s. It should be pointed out that arrival dates for stock at the yard can vary widely between different sources. Some reported arrivals at Leicester, others the day they were tripped down the branch to Braunstone Gate, while the most accurate were those when stock actually entered the yard and were booked in by the firm. At the start of 1987, the locos delivered previously were being cut and new arrivals were appearing regularly. In addition to the Class 25s and 45s, three Class 40s were delivered in January 1987, namely Nos. 40075, 40132 and 40163 from Derby. Also in January 1987, a team of cutters was dispatched to Thornton Yard in Scotland to process a number of Class 08s, 26s and 27s; the team remaining there until June. Back in Leicester, arrivals continued apace – both of locomotives and coaching stock. While the company had cut locos in Scotland, further Class 27s were sent south by rail between June and October. In total, 32 examples ended their days at Leicester, which for many was not far from where they had started their working lives in 1962. Class 20s sold (Nos. 20155/62/91) arrived in November. Numerically, 1987 was the peak year for locomotive arrivals and, by the end of the year, the famous stack of Class 25 and 27 was very much a feature of the yard, with the locos stacked three high off their bogies. Not content to cut redundant stock, the firm also made use of its asbestos-removal facility to strip the material from rolling stock that had been sold for preservation. No. 40013 and Class 27 No. 27059. Although numbers were lower in 1988, the variety increased. The first Class 50 No. 50006 was taken in to the yard on February 8, and more of the class were to follow the next year. Also in February, it took delivery of two Class 31s Nos. 31176 and 31440. May saw the arrival of a further eight Class 20s and the first Class 47, No. 47131. In June, the first Class 08s for scrapping – Nos. 08253, 08474 and 08722 – were delivered from Derby Works. A further batch of 14 Class 45s arrived in July and August from Toton. In October, the firm cut Class 31 No. 31202 into two halves at Staples Corner, Cricklewood after the locomotive – along with No. 31226 – had run through the buffers and was perched precariously above the road. The back of No. 31202 had been broken by No. 31226, which landed on top of it. The final deliveries in 1988 were six Class 25s, which had been in store at Carlisle Upperby and arrived the week before Christmas. Although 1988 was quieter regarding locos, a steady stream of DMUs, EMUs and loco-hauled coaching stock had arrived each month. A new year dawned with two further Class 31s, Nos. 31167 and 31227, being delivered on January 19, 1989 from Tyseley. A cutting team was operating at Eastleigh Works in February and March, where it dispatched Class 33 Nos. 33001/10/49. An additional new class for cutting, Class 03 No. 03397, arrived from March TMD on March 23, accompanied by Class 08 No. 08558 and Class 47 No. 47103. The previous day saw two additional Class 47s Nos. 47408 and 47420, plus Class 25 No. 25202, arrive from Doncaster. Scrapyards always saw ‘foreign’ locomotives arrive for cutting, such as BR Clans at Darlington, LNER V2s at Swindon or SR Merchant Navys at Slag Reduction, Rotherham. Accordingly, the arrival of a further four Class 50s from Laira resulted in a flurry of interest from local enthusiasts, who flocked to Upperton Road Bridge to view their presence in the yard. Other locomotives to end their days that year included further Class 08s, 31s and 47s. The year 1990 was the last complete one in which the company was trading. More than 450 DMUs, EMUs and hauled coaches were delivered to the yard, while locomotive numbers were low. However, they did include the only Class 37 to enter the yard, No. 37062, which arrived in April. This was followed in July by Class 85s Nos. 85019 and 85025 – again, the only members of the class cut at Leicester. The final locomotives delivered were Class 33s: six in September and three (Nos. 33011/15/17) in November. The very last deliveries of all to the yard were 14 DMUs from Crewe Basford Hall, which arrived by rail on March 4, 1991. On the morning of March 10, 1991, a fire developed in one of the stacks of coaches, which sent a plume of smoke and asbestos dust across the city. More than 80 fire fighters were involved in bringing the conflagration under control, which destroyed many of the vehicles waiting disposal. The cause of the fire was never ascertained, but was thought possibly to have been caused by vagrants sleeping in the carriages. Whether as a result of the fire or for other reasons, the firm was clearly struggling financially and was declared bankrupt with debts of more than £4 million. For Vic Berry, this spelt the end of his operations at Braunstone Gate, and he ceased trading on June 10, 1991. It should be noted that the firm of AE Piggot continued trading out of Braunstone Gate until the end of 1995, when the last train of scrap left its yard. This was not the complete end for Vic, however, who attempted to restart the business at St Mary’s Mill Lock, near Leicester, in 1998. He took delivery of Class 31 No. 31217 from Toton in June of that year, along with the body shells of Class 47 Nos. 47142 and 47147 from Brush, Loughborough. The locos were not finally cut until November of the following year, however, and no further purchases are known. Vic himself reportedly passed away in 2004. After the yards finally closed, the Braunstone Gate site was cleared of all remaining scrap and decontaminated. Today the area features homes and office units, while Upperton Bridge and the footpaths that gave views of the yard remain in place.